Though the humans manage most of the day-to-day tasks at MyUntangled Media, if you know anything about us, you know our company DOG is really the one in charge. So you can imagine how much Ruby jumped (and rolled and barked) at the chance to work with a couple of his favorite canine computer companions! 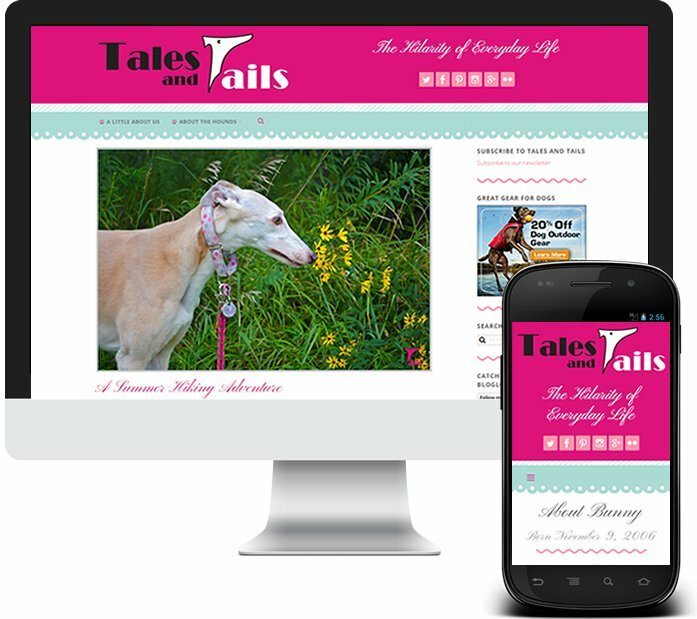 The story of this WordPress blog makeover is a simple tale that starts with a couple of hounds who were ready to shed their out-dated template. This award-winning blog was already quite pretty in pink and teal, but knowing how much it complemented their grey(hounds), they wanted even more and were ready to dig in their paws until they got it. So how did we get those tails wagging once again? We started out with a custom logo design that no dog could turn their nose up to and stayed on that scent until the dog house was filled with coordinating custom graphics fit for a diva. What a happy ending for this pack and for ours – see it live at TalesandTails.com!